I.O.U.S.A. 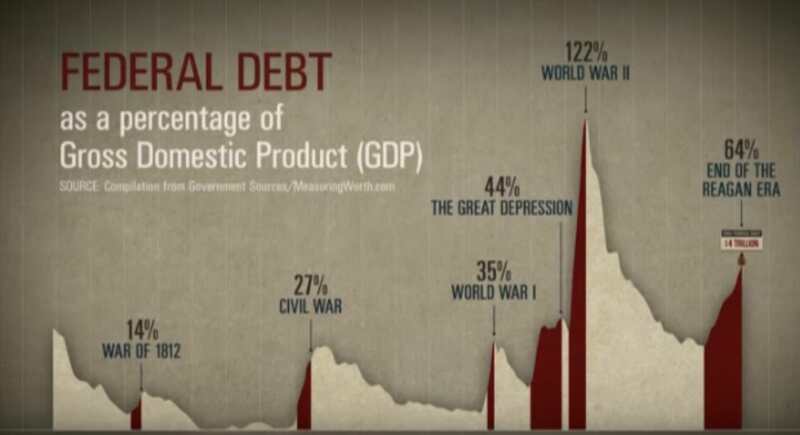 a 2008 political and economics documentary examining the history of US Federal debt level relative to gross domestic product (GDP), a figure that has reached frightening highs in the last decade. Of course, the US has been in debt for almost all its history. In fact, the 1830's was the only time that Federal debt got down to 0% of GDP. Today it is approximately $20 trillion dollars or 106% of GDP. This makes one sceptical about president Donald Trumps new plan for a Space Force branch of the army. Perhaps he thought “Starship Troopers” was a documentary? In February 2007, the United States federal debt stood at $8.7 trillion, more than doubling over the term of George W. Bush's presidency. The situation will only get worse over time with known future spending such as payment of social security to the baby boom generation. The issues? The United States has had a history of consumption, spending more than it has available, especially during war years, most specifically during World War II and the Iraq conflict of the 21st century. There is also a history of non saving, both by the government and by individuals which leads to lack of investment moneys. And in the new global economy, the United States has the highest trade deficit in the world, reliant on other countries, especially China which holds more than half of the United States' treasury bonds. Overriding these issues is a lack of political leadership, politicians who really don't seem to know how to get the country out of this financial hole.